All holy scriptures, brought down to man from divine inspiration, have confessed that the human form is the form most adored by God. It is deemed as the one and only medium through which God can be felt, heard, and seen. Our real nature is that of divinity. God is within us, but, because we are not aware of this, we employ all our time in trivial issues of the world, which will not last. Bible clearly says, “Seek first the kingdom of God and His righteousness and all else will be given to you.” Meaning that, by realizing God, we do not lose any other part of our life but, instead, our life is made complete with the prime aim successfully accomplished! Divya Jyoti Jagrati Sansthan (“DJJS”) under the mentorship of Shri Ashutosh Maharaj Ji (Head & Founder – DJJS) is determined towards its vision “From Self Awakening to Global Peace” through the eternal science of self-realization – 'Brahm Gyan'. 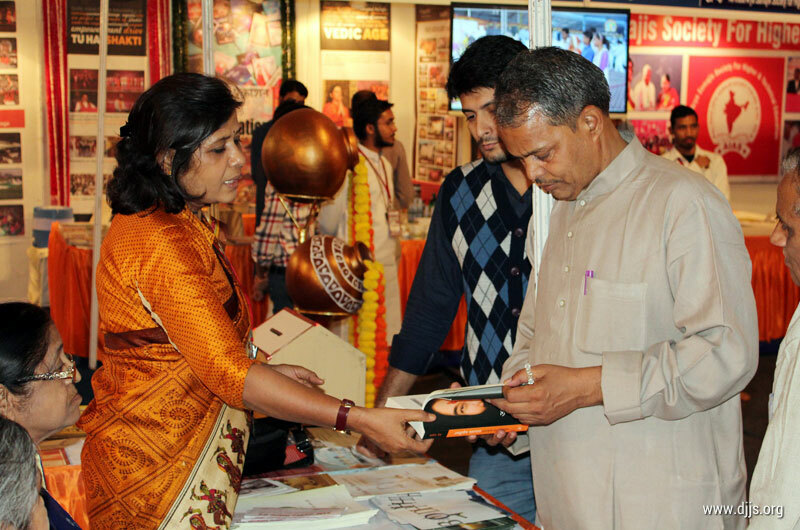 Continuing this, DJJS exhibited its initiatives in form of a stall put in the 3rd Hindu Spiritual and Service Fair, Jaipur, Rajasthan from 16th to 20th November, 2017. Various social & spiritual initiatives of the Sansthan were also displayed at the stall, like Antardrishti (for Visually Impaired People), Antarkranti (for the Prison Inmates), Kamdhenu (for Cow Protection), Sanrakshan (for environment conservation), Santulan (for Gender Equality), Youth workshops, etc. Sansthan’s literature was available on the stalls along with audio-visual aids. God has accorded us an opportunity to transform ourselves by performing good and pious deeds and to make sincere spiritual pursuits to realise His all-loving Self. Brahm Gyan is the eternal science of Self Realisation. It is the immediate and direct perception of the Inner Self (Soul/Atman - Particle of Parmatman). In spiritual parlance, it is the process of seeing and realising the True Self (Atman) within the human body through the subtle faculty of Third Eye (Divine Eye). When a person gets initiated into the eternal science of Self Realisation, Brahm Gyan, he becomes equipped with the art of practically perceiving the light of his inner conscience. This results in a total transformation in his mind-set. When an aspirant meditates on the light of inner conscience, his thoughts and mental proclivities begin to fall in the ambit of awakened consciousness, thus becoming deluged with positivity and wisdom. This transformed and positive unit thus becomes perfectly eligible to play a pivotal role in bringing a revolution in the world. On these grounds, Shri Ashutosh Maharaj Ji is today bringing a change in the world by bringing reformation in each and every individual by the dissemination of Brahm Gyan (Divine Knowledge). The Sansthan successfully delivered this message of Inner awakening to the masses.